Some folks look forward to Christmas; I look forward to the State Fair. I suppose it’s something linked in my head from childhood, where birthday trips were often taken to the Arkansas State Fair (I seem to recall it being earlier in the year at that time, but perhaps we just celebrated my birthday a few days late) -- the one time of year I’d indulge in all those things children dream about, great fun rides, midway games and foods I couldn’t have at any other time. The latter’s now one of the beats I cover, a fascination of mine that I can’t quite shake. This year I’m going to explore not just our own Arkansas State Fair, I’m traveling to Dallas the week before to experience the Texas State Fair as well. Why? Lots of reasons. Many of the things that are introduced there (and at the Minnesota State Fair, which I hope to attend next year) come here and are popular items. The Texas State Fair also has one really crazy competition -- the fried-things competition -- and that’s where we get crazy stuff like fried Oreos and fried Dr. Pepper and such. Just got my information for this year’s Arkansas State Fair and have been looking through it. Most of the favorites are back, but among the new items are a few surprises. Going through the list, I noticed some “new” items that didn’t seem new to me at all, like elephant ears. I woulda sworn we’ve had elephant ears at our state fair. I know I’ve seen them on the local level. Wisconsin Fried Cheese? I know for certain I ate that two years ago, I have photos! Still wish we could get some squeaky cheese this direction. I can’t quite fathom that biscuits and gravy are unheard of at the State Fair, but there they are on the list. Biscuits and chocolate gravy also make the list. I’m going to avoid both -- you’ll understand why in a few weeks. I am curious to see if Mozzarella Fingers are just mozzarella sticks or some mutant large item that I will endeavor to consume in mass quantities. There are some interesting, particularly hillbilly sort of things that are making their way into our fair this year. Like Hillbilly Hollar Fruit Drinks (which would seem to me to be some form of pre-moonshine, but I could be wrong). Hillbilly Homebrew is also on the list -- I’m guessing this will be root beer, but I could be wrong. Also among the listings: BBQ Rabbit Sandwiches. I like rabbit, but what are you really getting here that’s different from beef or pork barbecue? Unless we’re talking about a smoked rabbit. Something I’m sure lots of folks are going to try are Chocolate Smooches. These sorta make sense. We’ve battered and deep fried a whole lot of other things -- why not batter and deep fry a Hershey’s Kiss? I’m hoping on this front that they are individual Kisses -- that’d make for better sharing. And as we all know, the best part of most Fair foods is sharing them with the ones you haul out to the fairgrounds. Of course, there will be items on a stick, one being Swiss & Rye on a Stick. Perhaps it’s a weird version of a cheese stick? Odder still is Egg on a Stick. Boiled? Battered? Deep fried? You got me. That’s what my Texas State Fair research will be all about. I’m also very interested in checking out the Cabritas Wrap… which apparently includes goat. I have no problem with goat… in some instances, it can be quite tasty. None of these items, though, seem anywhere near as odd as Fried Beer. 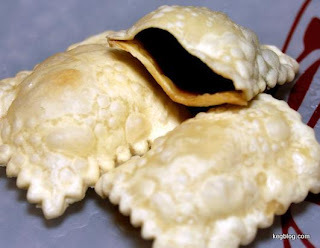 I’ve been doing a little research, and it appears that fried beer is a frozen beer concentrate tucked into ravioli, frozen, battered and deep fried. Personally, I am concerned about the combustibility rate of such a product. I mean, in theory something liquid put in a pasta package and deep fried should be at the boiling point when taken from the fryer. I wonder if they allow them to cool down first. There’s also word of a deep fried Cobb salad. I don’t know how that would rightly work. Anyway, planning to head there the weekend before the Arkansas State Fair so I can accomplish some well-needed research on the subject, and to galvanize myself against the ten day gastronomic adventure that is the Arkansas State Fair. Will I be surprised at Texas-sized proportions? Will I have my photo taken with Big Tex? And just how easy will it be to get from our hotel to the Fair, courtesy of DART? Lots of questions to be answered, that’s for darn sure. One way or another, there's no doubt as to this: at some point during the Arkansas State Fair, I will attend with my daughter. We will share a funnell cake. It will make us both very happy. Fair season is upon us. Be hungry. Be very hungry. hey, now you're a tv star! Congratulations! thank you for clearing up the mystery of fried beer (YUCK). I wondered how they did that, and if frying removes or reduces the alcohol content, like cooking w/wine. I had an ulcer a few years ago and I believe I will be passing on any and all items like these for the rest of my life, so as to HAVE a rest of my life. You ladies have fun. And I can't remember where -- the last fair I visited was AR/OK in 2003, which I highly recommend because of its size and cleanliness -- but I've seen elephant ears, too. Don't forget to TIVO, VCR, DVR, whatever, the last few days of World Turns. I haven't seen today's yet. I didn't think beer would freeze solid...but hey!!! All I can say is give me a funnel cake and roasted corn on the cobb and I'm a HAPPY girl...oh and a beer!